Madeleine Mantock wears black high top Converse “Chuck Taylor” All Stars in the film. 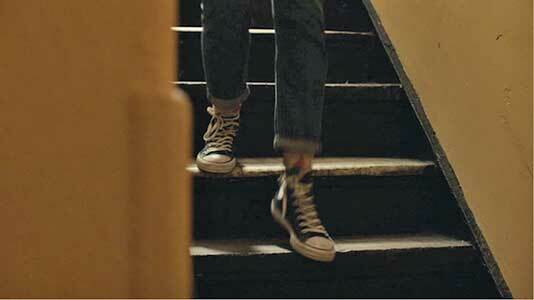 Colin Critchley wears brown high top Converse “Chuck Taylor” All Stars in the film. 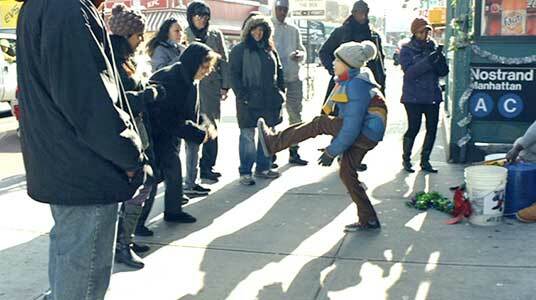 Aaron wants to be a dancer but can only practice on the streets of Brooklyn. Aaron Davis (Colin Critchley) and his older brother Albee (Nathan Kress) have a rough life as Breaking Brooklyn begins. It’s December in New York City, a festive time for many, but they and their widower father Randy (Brian Tarantina) are homeless, living in Randy’s car, which is in sad shape and needs repair. 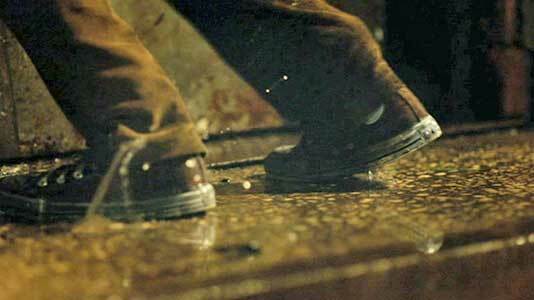 From some of the opening shots of the film, we discover that Aaron has a real passion for dancing, and often does routines in the streets. Both Aaron and Albee attend an arts school, where we see Aaron look longingly through the window at Mr. Miles Bryant’s (Louis Gossett, Jr.) dance class. But Randy doesn’t approve of his son dancing. The boys have a tough time at school, often tardy due to their situation and ostracized by other students because they often smell from not getting regular showers or having clean clothes to wear. Albee does try to get closer to Faith Bryant (Madeleine Mantock), Miles’ daughter who is in his chemistry class but she is stand-offish to him. Albee scrounges around for food money by selling bootlegged CDs and DVD’s on the street and sometimes shoplifting. One day on the streets he tries to horn in on a street drummer after Aaron starts dancing to the music and gets the crowd fired up. This leads to an altercation between Albee, Randy, and the musician (who is licensed) leading to Randy’s arrest after the police intervene. Randy has some unresolved warrants and when they are discovered he is taken into custody and later his car is towed away. The boys hurry off so they won’t be placed in the foster care system. Now they are completely homeless and must literally sleep on the streets. With no parental support of any kind, the two get into trouble at school when Albee forces Aaron to steal food from the school cafeteria, and he gets caught. Aaron dancing to the beat of a street drummer. When Aaron and Albee are brought to the principal’s office, Mr. Bryant intervenes. He has seen the potential in Aaron and invites the two boys to stay with him for now and over the holiday break while Randy serves out his jail time. This kind gesture begins to turn things around for Aaron especially, as Miles, Faith, and his estranged brother Greg (Vondie Curtis-Hall) live in an abandoned theater they purchased many years ago in more flush times. The two brothers were a famous act and toured the country with their music and tap dance routines although now they barely communicate. The theater is a mini-heaven for Aaron, who quickly tries out his dancing moves on the main stage in the first of several dance sequences in the film. Aaron also begins participating in Mr. Bryant’s dance classes and has his eye on a Brooklyn Borough competition that has a large cash prize. When Aaron insists to Miles that he wants to compete to win the prize, Miles starts to give him private instruction. Greg watches on grumpily, but can see that the boy has talent. Meanwhile, Albee and Faith start becoming closer, and we learn that she has talent as a singer, but hasn’t done anything about it, like taking voice lessons. There is a cute scene where he persuades her to sing in public with some Christmas carolers. After their father is arrested and his car towed, Aaron and Albee must live on the streets. The day of the dance competition, Randy is released from jail, but tells Aaron he still is opposed to him dancing in public. When the boys don’t want to go with him, harsh words are exchanged and Randy storms away angrily after Albee tells him he wishes he were dead instead of his mother. At the dance competition, Aaron starts out fine, then loses his self-confidence thinking about what Randy said, and blows the end of his routine. Later he and Albee cause a scene at the awards presentation, and Aaron snaps out at Miles in anger when asked what went wrong. There is another very dark cloud on the horizon. The bank with the mortgage on the theater is about to foreclose, something Miles has refused to acknowledge. He has spent all his savings and Faith’s college money without telling her, and still is under water on the loan. If something isn’t done immediately the Davis family will be out on the streets also. There is a poignant scene where a lady who was a longtime fan of Greg tells him how much she liked and remembered their act as she hands him the formal notice of impending eviction. In Mr. Bryant’s studio, Aaron laces up his chucks, while Albee surfs on Bryant’s laptop. It’s always darkest before the dawn, and that’s definitely the case with this story. Things start to change when Albee sets up a Go Fund Me account on the Internet, the principal characters reconcile, and things start to move in a positive direction as the film progresses to its happy ending. One can almost see Mickey Rooney saying to Shirley Temple, “Let’s have a show!” to fix things. Or perhaps it is like the Deus ex machina scene from a Baroque opera when suddenly the gods appear to rectify the dilemma of the plot, in this case due to the actions of long-time fans of the Bryant brothers. This is where the film now becomes more of a happy musical. There are some serious timeline and logistical issues that need to be overlooked, but you will still enjoy the film and the performances of Colin Critchley, Madeleine Mantock, and Vondie Curtis-Hall. Aaron prepares his outfit for his first dance competition while Faith looks on..
Close up shot of Aaron’s chucks while dancing in an alley after a rainstorm. When he is not wearing his tap shoes, Colin Critchley, in his role as dance prodigy Aaron Davis, wears a pair of well worn brown high top chucks. 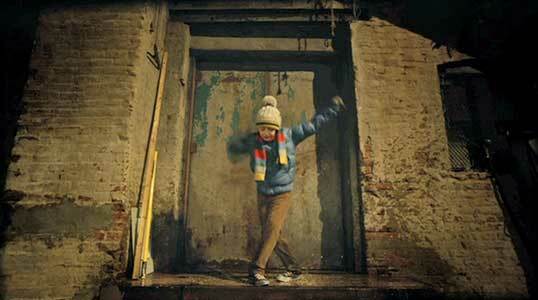 There are a number of scenes at the beginning of the film showing him dancing around in them. Madeleine Mantock, who plays Faith Bryant, wears black high top chucks throughout the film, even when singing on stage. We see them framed in the camera work in most of her scenes, and some good close up shots of her descending the stairs while bringing a plate of food to her Uncle Greg. Another close up shot from the same scene. As Faith descends the stairs, we see a close up of her black high top chucks. Breaking Brooklyn. (2018) Colin Critchley, Madeleine Mantock, Nathan Kress, Louis Gossett, Jr., Vondie Curtis-Hall, Bryan Tarantina. Written and directed by Paul Becker.